Lately we’ve seen an inordinate number of dogs having a bad hair day. There’s a simple explanation for that: Their owners have canceled their grooming appointments. There’s a simple explanation for that, too: canine influenza. In case you missed it – perhaps you just returned from a long vacation on a remote Polynesian island – there has been an outbreak of dog flu in the Midwest. Almost 2,000 dogs have been affected, with at least eight deaths reported. It is now classified as an epidemic. The Chicago area has been hit the hardest. In April we started an email campaign to tell you about the disease: about how it causes a cough, low-grade fever, lethargy, nasal discharge, watery eyes, sneezing, and a lack of appetite. We told you it was similar to kennel cough. 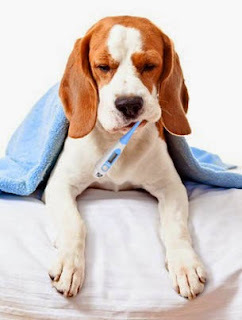 But unlike most cases of kennel cough, the flu can make dogs very sick, with some needing supportive care such as hospitalization, IV fluids, and antibiotics. At the time, the culprit appeared to be the H3N8 viral strain of canine influenza. Vaccines for Bordetella (kennel cough) and canine influenza are non-core, or “lifestyle,” vaccines, meaning they’re optional based on a dog’s exposure risk. We advise our clients on a case-by-case basis as to whether their pet needs them. The Bordetella vaccine is usually required by boarding kennels, puppy classes, groomers, and doggy day-care centers. Until now, those providers haven’t required the flu vaccine, but that might change. This flu outbreak caused severe economic hardship for many kinds of pet professionals. I applaud those who did the right thing and closed their doors during the worst part of the epidemic. But they lost plenty of income, and they won’t soon forget it. Be prepared for some of them to start requiring a flu shot before you cross their threshold with your four-legged friend. Why continue to use the existing flu vaccine when it doesn’t protect dogs from the new Asian flu? One reason is that the original H3N8 strain might also have been a part of this outbreak. Another is that the vaccine might confer some cross-protection against the newer Asian variety; nobody knows yet whether that’s the case. Most epidemics eventually fade away, and we hope this one is no exception. But even then, none of us knows if or when it will emerge again in the Midwest. Until the outlook improves, using the existing vaccine isn’t a bad idea if you’re going to board your dog this summer. Keep in mind that there are two vaccines in the series, two weeks apart, so your dog won’t have immunity until one month after you start. You can bet that every major veterinary pharmaceutical company is scrambling to develop the first vaccine that is effective against the Asian strain of influenza. Will we recommend immunization with this for certain patients? Stay tuned; I’m not prepared to commit to yet another vaccination for your dog. And I’ll base my recommendations on science, not hysteria. In the meantime it looks like the risk of flu is still present, but so far we in Lake County have been lucky. It’s okay to carefully dip your toe in the water again. Board your dog if you must, but make sure the kennel hasn’t had any recent cases of influenza. Check out DogVacay.com or Rover.com if you’re interested in in-home boarding. I’m still reluctant to endorse dog park, but we can’t keep our little buddies away from them forever. Ask your pet’s other professionals whether they’re carefully screening the dogs they take in. One thing they should be asking their clients is whether the dog has been boarded within the past two weeks. (Sorry, Fido, you’ll need a two-week quarantine.) If you’re satisfied, let your pooch have a nice day at his doggy day care. And take him to the groomer! He’s a little grungy, and he needs a haircut. Lawyers deal with hostile witnesses and rancorous spouses, policemen withfelonious thugs, salesmen with constant soul-sucking rejection, and veterinarians with -- cute little kittens, sweet old dogs, and cuddly bunny rabbits. We’re so lucky to be a part of a stimulating, fun, helping profession. But hey, it’s not all unicorns and rainbows on our side of the exam table! Among the many challenges in our profession is dealing with complaints. A complaint, whether justified or not, can cause us regret, anger, bewilderment, hurt feelings, and sleepless nights. We’re just like everyone else, because we care very much how the world perceives us. 1. One might assume that a business owner is aware of how everyone in her employ behaves. One would be mistaken! Sometimes I wonder if I’m the last to know about the underbelly of my practice. And it’s not just me; I’ve heard many other business owners voice the same lament. For example: A former employee didn’t show one of our clients the proper respect. After that team member left, other employees told me that she had occasionally been curt and bossy with customers and colleagues alike. The revelation gave me a chill. How could I have been so clueless? My team members enlightened me: Working with another person when you fear retribution from them is unpleasant, at best. Sometimes we bosses can be really ignorant! Don’t assume we’re aware of the chinks in our armor; speak up. 2. Try to distinguish justified from unwarranted anger or disappointment. It’s easy for clients to develop unrealistic expectations of what veterinarians can do. Unfortunately, we can’t always diagnose a pet’s maladies without considerable expense or a referral. Even with a diagnosis, we can’t always save a precious life. And like you, we’re hampered by the fact that there are only so many hours in a day, so we can’t always return every phone call right away, or immediately see every patient that needs seeing. 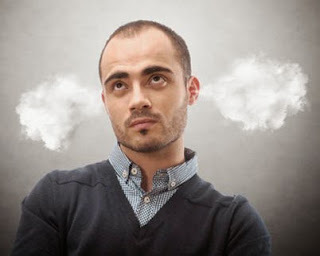 Every once in a while I find myself feeling irritated toward someone else’s employee, usually because I perceive them as not doing a good job or because they’ve delivered bad news. I’ve learned to (mostly!) hold my tongue, because further reflection makes me recognize a few realities: I was impatient because my day wasn’t going well; the worker wasn’t adept at her job, but at least she was trying; the company’s policies aren’t the employee’s fault. If you feel wronged, take some deep breaths and decide whether the business actually fell short or whether you were really just angry at your spouse, or upset because the car needs repairs -- again. 3. If it truly is about us and not about you, it’s time to send us an email, or pick up the phone and give our practice manager or one of us veterinarians a call. Sometimes scheduling a time to come in to discuss your concerns will go a long way towards resolving them. Feedback and criticism can be indispensable. You’re the reason we exist, and we try hard to please you. If something makes you uncomfortable, unhappy, or disappointed, we want to know. We welcome the time you take to help us make improvements. But please be courteous, and we’ll return the favor. While meandering through my college campus in the early 1970s, I would drift in and out of hazy wisps of pot smoke. The pungent aroma was as much a part of campus life as were the young couples making out under the bell tower. The campus police turned a blind eye toward such transgressions, and my impression then was that pot would be legalized sooner rather than later. Wrong! It wasn’t until the mid-’90s that California legalized marijuana for medical use. Since then, 22 other states and the District of Columbia have passed laws legalizing it, including four states giving the nod to recreational use. Marijuana, also known as cannabis, has been used for medicinal purposes for 3,000 years. The cannabis plant produces more than 60 chemical compounds called cannabinoids. One of those is tetrahydrocannabinol (THC), the psychoactive ingredient that provides the high for which marijuana is known.1 But there are others that have medicinal effects without altering consciousness. The known therapeutic effects of cannabinoids on people are diverse: Among other things, the compounds can relieve pain and inflammation, alleviate nausea, prevent the growth of blood vessels that supply tumors, subdue muscle spasms caused by multiple sclerosis, stimulate appetite to prevent weight loss caused by illness, help control seizures, and have anti-viral activity. Marijuana’s medicinal use has piqued the interest of veterinarians. If pot works so well in humans, could it be of benefit to animals? It turns out that it does seem to help them. 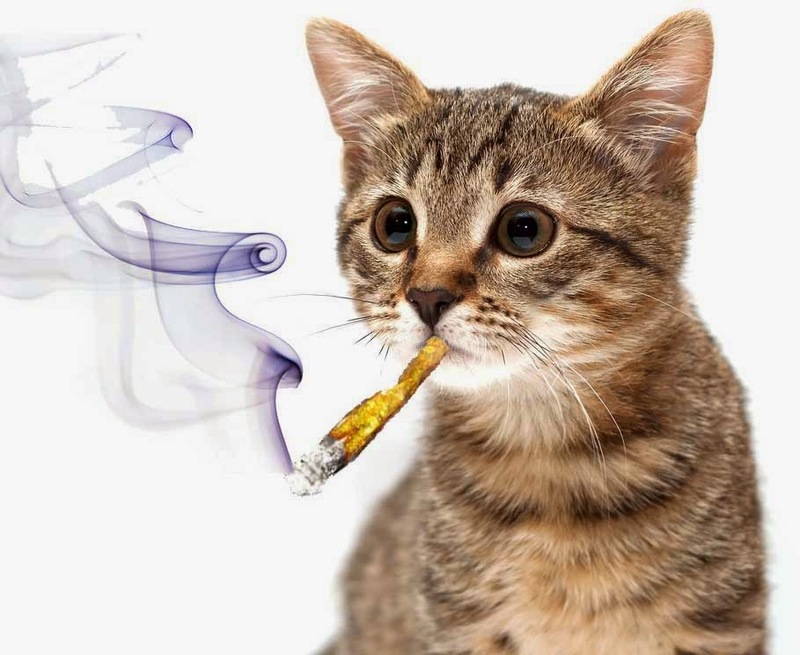 It’s illegal to use marijuana on animals in all states, but that hasn’t stopped pet owners from trying it. Veterinarians in states that have legalized pot have heard hundreds of stories from clients who have used the drug, often with good results, to help their sick pets. I’ve read dozens of articles online by pet owners who turned to marijuana when mainstream drugs failed to control their pets’ pain, nausea, behavioral disorders, or weight loss. That is hardly scientific data, and I certainly don’t recommend that my clients try this at home! 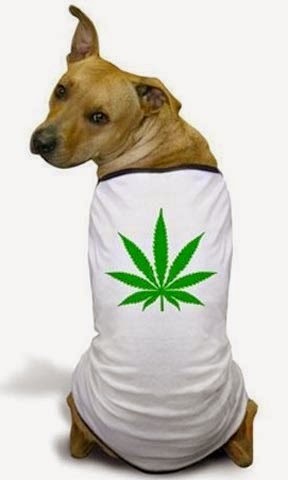 In fact, it’s illegal in every state for veterinarians to prescribe or recommend pot to treat pets. There’s a risky side of this coin: marijuana toxicosis, which usually occurs after the ingestion of baked goods containing the substance. This toxicity is no joke; a dog that has eaten marijuana will begin to show clinical signs -- incoordination and drowsiness, dilated pupils, a slow heart rate, possibly a loss of consciousness -- 30 to 90 minutes after ingestion. Death is rare, but possible. THC is stored in body fat, so the effects of the drug can last for days. Marijuana is classified as a Schedule I controlled substance, which is the most restrictive of the federal Controlled Substances Act categories and designates drugs that have no accepted medical uses and a high potential for abuse. Although many states allow the use of medical marijuana, federal law prohibited it until late last year. DEA agents would periodically raid medical marijuana dispensaries and shut them down. This is no longer the case, but could change in the future under a less tolerant administration. You can see how government policies might dampen drug companies’ enthusiasm for doing more research and developing more medical uses for marijuana. If pot were to be reclassified as a Schedule II drug, research grants for exploring its medical potential in both humans and animals would become easier to obtain. Without hard scientific data gleaned from research, there’s no way to learn which cannabinoids are effective in animals, what the proper dose is, and for which conditions they are efficacious. My feeling is that some cannabinoids probably do provide therapeutic benefits, and that there is ample justification to study them (the non-psychotropic compounds). It seems a shame that government policies are squelching the quest for more safe and effective drugs to help humans and animals alike. Right now, marijuana is stigmatized by its classification in Schedule I, with the likes of cocaine and heroin. I look forward to its reclassification to a Schedule II substance to stimulate research. 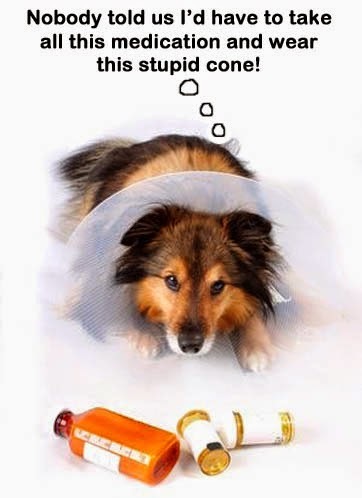 Until then, please wait for medical science to catch up to the demand for pet medical marijuana. Until it has been thoroughly studied in animals, we cannot assume that marijuana affects humans and animals in the same ways, nor can we assume that it isn’t harmful. As pet owners, we all face the possibility of our beloved furry friends developing problems for which the drugs in our armamentarium are ineffective. But dosing your pet with pot may be putting him or her at risk. 1 The supplement industry has taken advantage of the reputation of medical marijuana in humans and has formulated dog treats containing hemp-based non-psychoactive cannabinoids and small, legal amounts of THC. One company that has capitalized on the pot craze is Canna-Pet. They make capsules and biscuits containing a “unique golden ratio of cannabinoids.” Their dramatic claims of multiple benefits and aggressive claims of safety and efficacy awakened my cynical neurons. No real research seems to support their claims, which are based on anecdote and extrapolation from the human side. I doubt that these products are harmful, but just realize that you might be wasting your money if you buy them. That being said, several veterinarians on our Veterinary Information Network say they have patients that have taken these products with varying success. Not a ringing endorsement, but pet owners can give them a try without worrying that they’ll make Fido high.